This week, From the Top comes to you from the E.G. Conference at the Golden State Theater in Monterey, California, where an incredible 9-year-old pianist plays Chopin, a 16-year-old double bassist plays a piece written for Picasso’s 90th birthday, and ukulele virtuoso Jake Shimabukuro performs some of his own compositions accompanied by our young musicians. Watch the entire episode on YouTube! 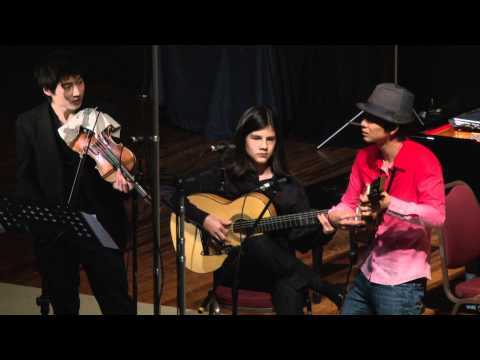 Ukulele player Jake Shimabukuro, violinist Charles Yang, guitarist Roberto Granados, and double bassist Emily Brown perform “Trapped” by Jake Shimabukuro, arr. Lee Blaske. Alums Performing with California Symphony This Sunday!